Listen to rock? Then you've heard one of these! In 1963, Fender revamped its range of amps. The line had been updated previously, in 1960, when, at the behest of regularly gigging customers, Fender replaced its attractive but fragile tweed covering with the more hard-wearing Tolex. "This was the start of Fender's 'blackface' era, during which the company produced some of its most revered valve amplifiers"
1963's revamp featured a black control panel with white lettering (or 'blackface') and upgraded circuitry; spearheading the launch was the new Deluxe Reverb. This was the start of Fender's 'blackface' era, during which the company produced some of its most revered valve amplifiers. 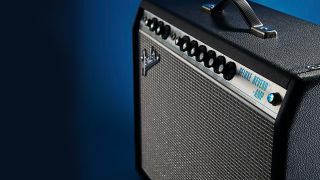 The Deluxe Reverb was a redux of Fender's tweed Deluxe amp; the most obvious of the Deluxe's improvements over its predecessor was the inclusion of a spring reverb tank, which offered a lush reverb effect that's prized to this day. The Deluxe Reverb also boasted two channels, one 'normal' and one 'vibrato'. Its versatility and extra headroom, which made lush clean tones available at gig volumes, saw it become a hit with gigging musicians in many genres, from surf rock to jazz, while in the studio it became one of the most recorded amps in popular music.